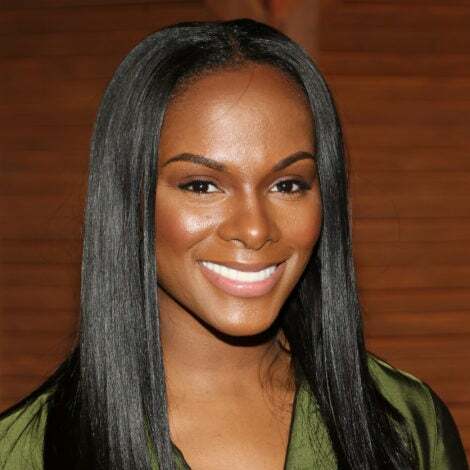 First Lady Michelle Obama promoted her “Let’s Move” campaign in Newark and Harlem on November 19, 2010. First Lady Michelle Obama plays on the field during the NFL’s Play 60 campaign to fight childhood obesity at Brock Elementary School September 8, 2010 in New Orleans, Louisiana. U.S. First Lady Michelle Obama plays on the field during the NFL’s Play 60 campaign to fight childhood obesity at Brock Elementary School September 8, 2010 in New Orleans, Louisiana. 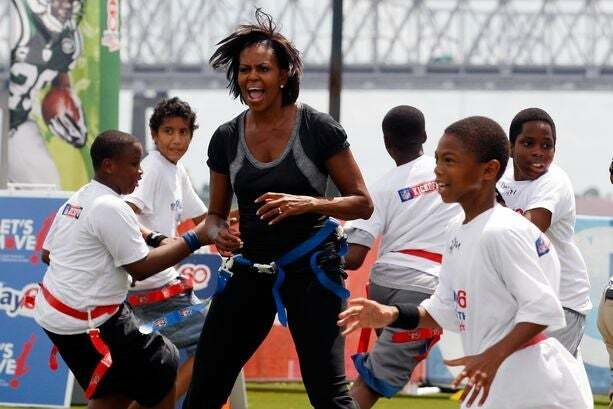 U.S. First Lady Michelle Obama catches a football on the field during the NFL’s Play 60 campaign to fight childhood obesity at Brock Elementary School September 8, 2010 in New Orleans, Louisiana. 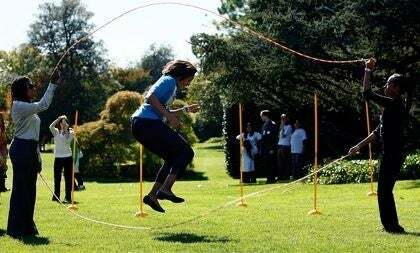 The First Lady showed off her jump roping skills last week at the launch of the President’s Council on Fitness, Sports, and Nutrition with students and community leaders in Washington, DC. 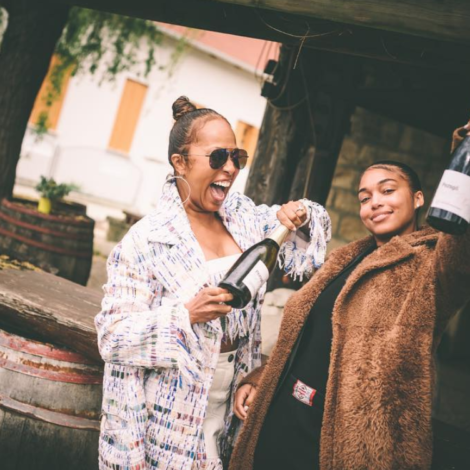 Like most working mothers, the First lady has to know how to juggle her priorities. 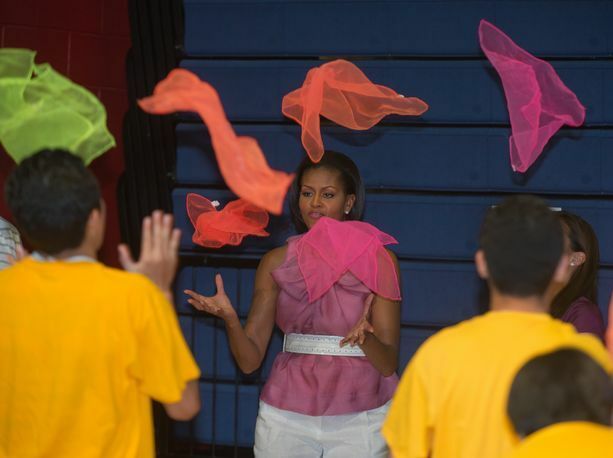 Here, she plays with the students and juggles a few colored scarves. Looks like the FLOTUS has soccer fever like the rest of the world as she kicks around a ball with some kids and soccer pros. The event was to emphasize the importance of kids getting at least 60 minutes of active play each day. 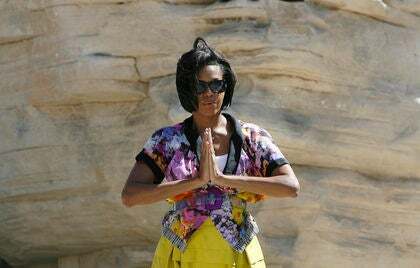 Michelle Obama takes a mountain stretch during the Let’s Move Outside program in Red Rock Canyon. Stretching and focusing on one’s breathing is also important for growing children. Here, the First Lady, surrounded by a picturesque setting just outside of Las Vegas, exhales. Like a proud parent, Mrs. Obama takes a break and watches the local students play on the South Lawn. Michelle Obama jogs in place along with some local students on the South Lawn of the White House. Looks like these kids can learn a thing or two about hustle from the First Lady. In May, Michelle Obama kicked off a series of South Lawn summer fitness activities for kids. Looks like she’s having just as much fun as they are. By the way, love that our First Lady wears Chucks. 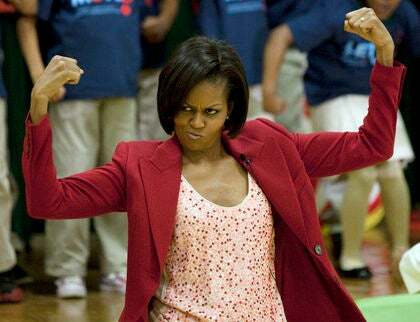 The First Lady shows off her muscles to the children at the DC River Terrace School. The First Mom “climbs a rope” with a group of grade schoolers and has them all giggling in joy. The gymnasium is filled with smiling faces as the First Lady does jumping jacks along with this elementary school gym class. 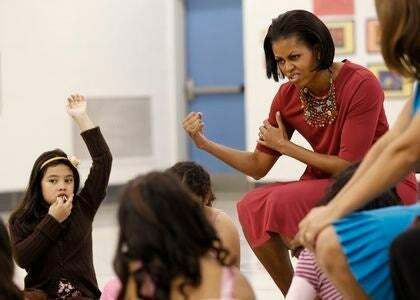 Michelle Obama flexes her biceps before a group of young students at a New Hampshire Elementary School. 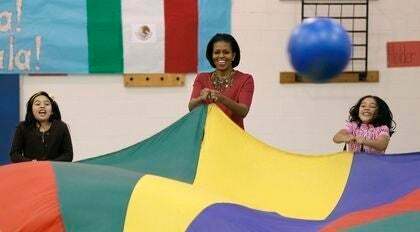 Michelle Obama plays a parachute game with a group of young kids in their gym class. Everyone quickly pulls on their side of the parachute and makes the ball jump! The kids are having so much fun. During her trip to Mexico, the First Lady jumps and dances with school children in a low income neighborhood in Mexico City. 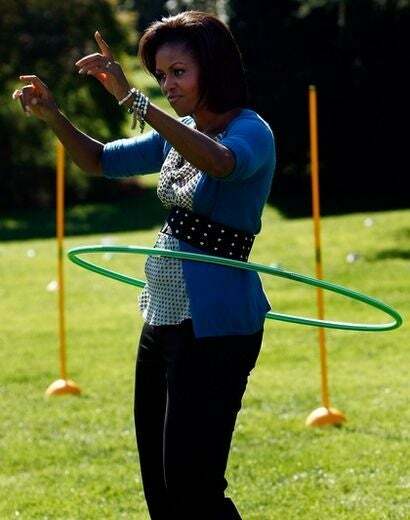 In October, Michelle Obama worked a hula hoop at her Healthy Kids Fair on the South Lawn of the White House. 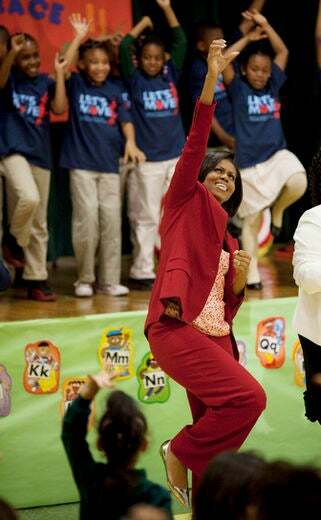 Mrs. Obama got her Double Dutch on during the event, too!